Home | Explore Nature this Summer with Marin GreenPlay Camp! Explore Nature this Summer with Marin GreenPlay Camp! This summer, have your kids explore the nature around them at Marin GreenPlay Camp! Marin GreenPlay Camp, voted Best Summer Camp in 2017 and 2018 by Marin IJ readers, is an innovative and place-based nature awareness camp for kids entering kindergarten through 12th grade that takes place at locations throughout Marin County. This year, Marin GreenPlay is celebrating its 10th anniversary. They're also the sponsor of our 2019 Marin Summer Camp Guide! 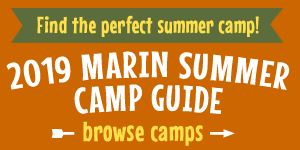 For the 2019 season, Marin Greenplay offers 10 unique camps for a wide range of age groups. For younger children (grades K to 2), they offer Watershed Warriors, an entry-level nature program that features exploring, games, art, storytelling, and more, including a not-to-be-missed week at Green Gulch Farm; and StoryPlay, for grades 2 to 4, which offers imaginative play in nature based on favorite children’s books. Older children in grades 3 and up will enjoy Dog Days, a camp for kids and their dogs that teaches kids how to walk their dogs on the trails and much more; Nature Makers, which offers nature-inspired jewelry and craft-making; and Summer Beats, which offers nature-inspired digital music composition. Marin GreenPlay also offers mobile camps. Rock Five Level 1, Rock Five Advanced, and Rock Beyond, for grades 3 to 12, are multilevel, state-the-art day and overnight outdoor rock climbing camps—the only camps of their kind in this area—that take the kids to the best climbing destinations in the Bay Area and beyond. Ocean Explorers for grades 3 to 8 gets kids out paddleboarding, kayaking, and boogie boarding, as well as learning marine science in Marin's tidepools, while Marin Treasure Hunt (grades 3 to 8) teaches wayfinding and orienteering through the engaging activity of geocaching while biking beautiful Angel Island. Most mobile camps leave from and return to Mill Valley Middle School. Teens can also participate in Marin GreenPlay's after-school Youth Leaders Program training course held each May, which provides them with naturalist and leadership skills and invites them to help out at camp year after year through high school. Camp sessions cost from $250 to $1595. Half-day, full-day, and overnight options are available, as is free before- and after-care. Campers also have a lunch option. Marin Mommies readers: get a $25 per week discount with code MARINMOMMIES. For more information or to register, visit www.maringreenplay.com or call (415) 264-2828.